I thought I would take some time to explain how I prepare the raw foods that I feed to my carnivorous / predator fish and my anemones. This results in a higher quality food for less cost than purchased frozen fish foods. 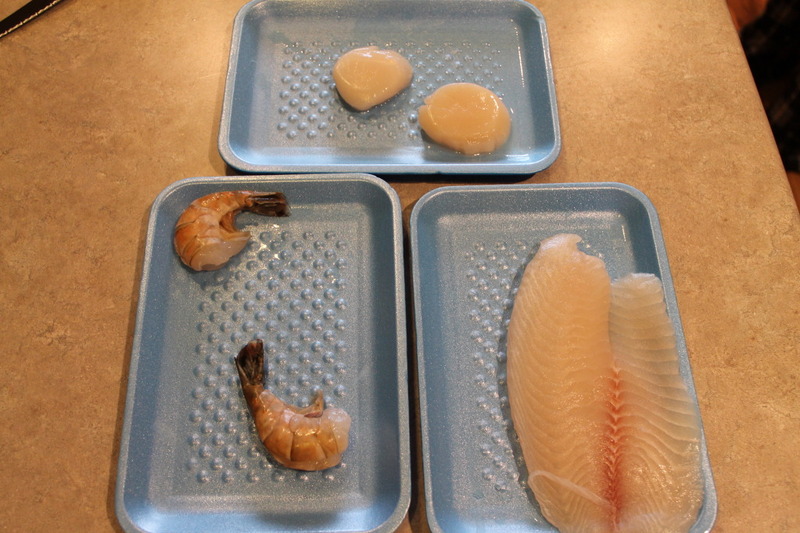 For the anemones, I will typically use fresh uncooked tilapia, shrimp, mussels and scallops as they are all high quality protein sources and are relatively cheap. They are also meats that are typically lower in oil/fat content. The exact fish I use will also depend on what is available to buy where I live. I will buy them from a local grocery store to ensure I am getting the same quality of food that I often enjoy to eat. When I return from the store with the fish food, the first thing I will do is wash the fish very well in running tap water and wipe it dry. RO water will also work every well for this. 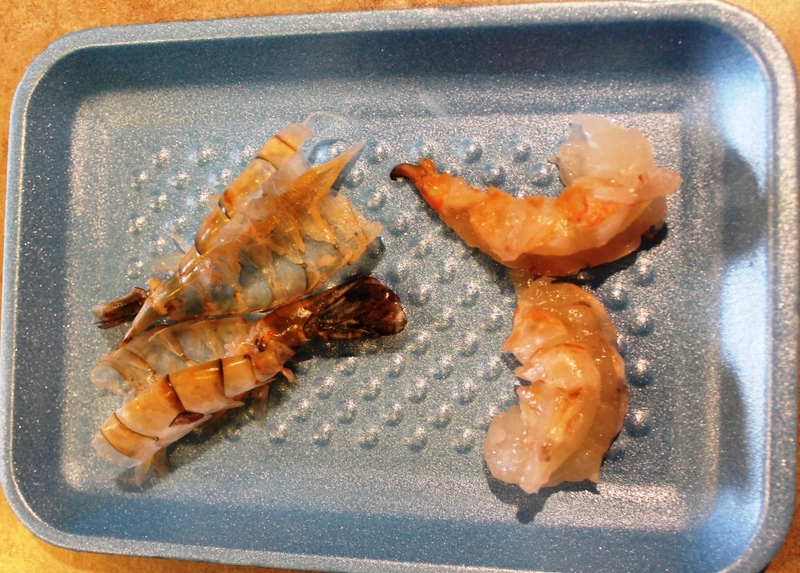 If I am preparing shrimp, I will first remove the outer shell. If I am preparing mussels, I will remove them from the shell as well. I will then cut it up in sizes that are more appropriate for the critters that I am feeding. As I have a larger carpet anemones, I will cut some larger pcs for them and some smaller pcs for a smaller seabay anemone that I have as well. When cutting up raw fish, you have to keep an eye open for bones. You do not want any bones in the food. 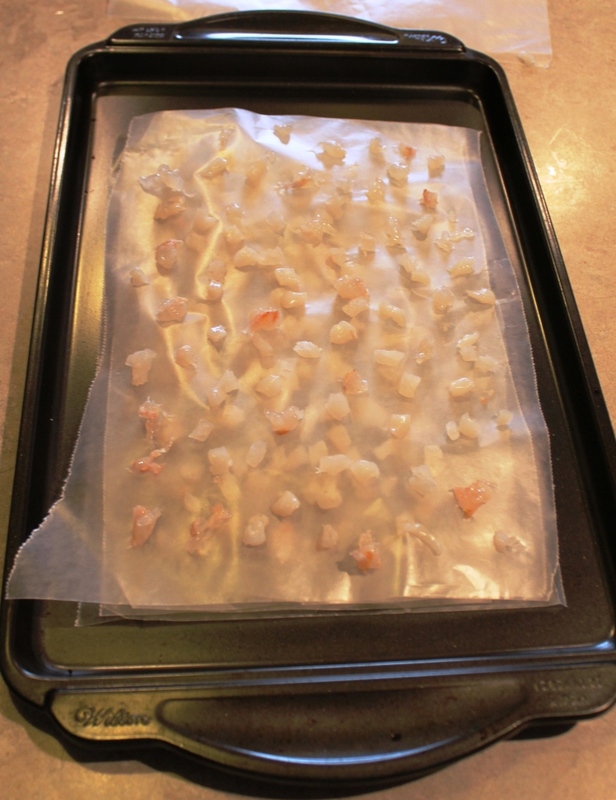 I will layout the cut up pcs on wax paper, then stack these sheets on a tray and place them in the freezer overnight. 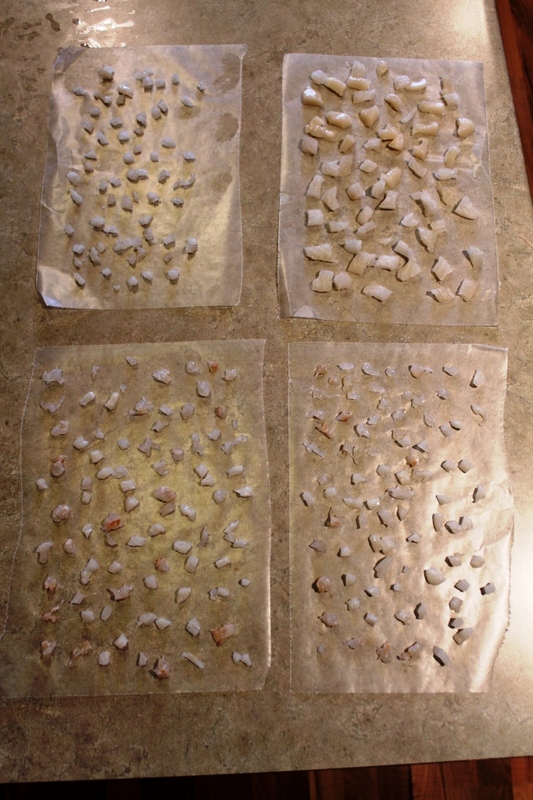 Once frozen, I will bag these up in freezer bags according to size to make it easy for me to get the correct food. The above describe process is more intended for my anemones, but can be applied to feed almost any marine predator. But I will take a slightly different approach for my lionfish. Just as with my anemones, I will not feed them any frozen fish foods. 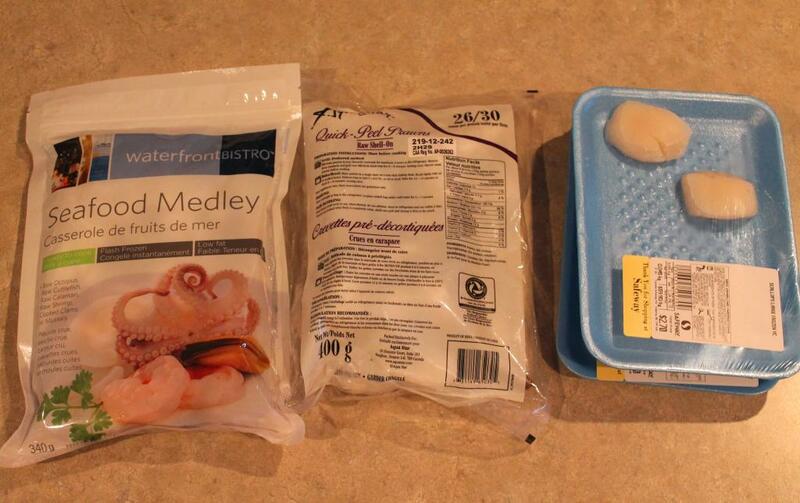 I will purchase: shrimp, squid, octopus, and scallops that were intended for human consumption from the grocery store. It is very important to alternate the different types of foods you feed most marine predators (like lionfish) to ensure the get a wide range of nutrients and proteins into their diet. As the squid and octopus can be very hard to find, I will usually have to purchase an already frozen sea food package from the store with these two different meats in it. After letting the frozen meats partially thaw in a bowl of cold water, I will wash it very well in cold water and cut up all the different meats that I want to use as fish food. I will base the size of the food pieces on how big my fish are to make sure the food will not be too large to cause potential problems. This is also why I will only make about a 4 month supply of food at one time, allowing me to adjust the size of the food as my fish grow. 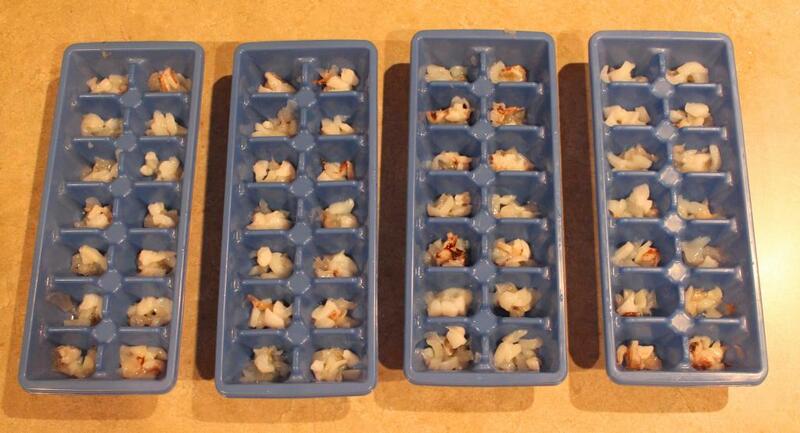 I will place this food into ice cube trays so that one cube will be equal to one feeding. I will try my best to ensure there is every different type of meat in each of the cubes to make it easier for me to offer my fish a daily variety in their diet. Now I just have to take a single ice/food cube out of the freezer and let it thaw in a small bowel or glass of tank water or RO water before feeding. 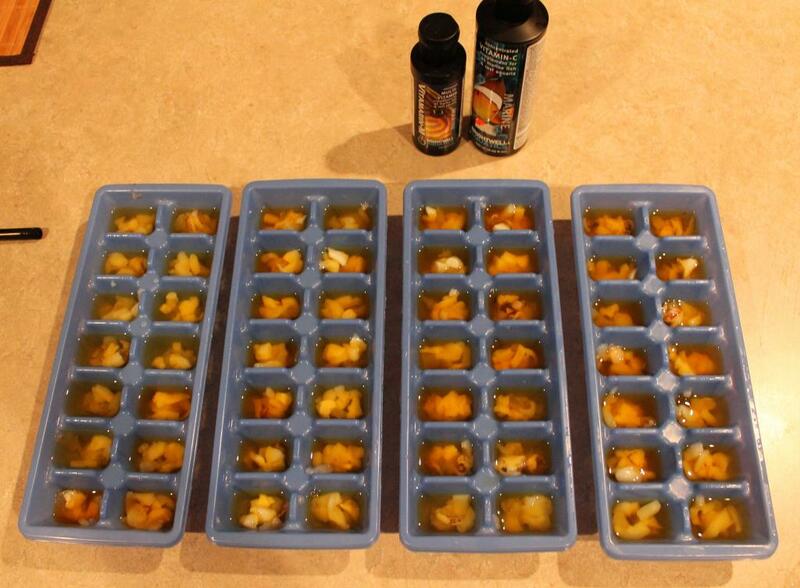 I have found this is one of the easiest ways to feed the best quality froze foods to my fish. Just a concern about buying prepackaged frozen raw fish from the grocery store. Sometimes they will be packaged in a salt brine that contains preservatives to help them last longer. You will want to thaw these in a larger amount of tank or RO water followed by a good rinse to help remove these preservatives and any other additives that might have been used in the brine. Read the label and make sure you are comfortable with feeding it to your critters before using it. I have only ever found one brand of food that contained a preservative that I was not comfortable with. I do not feed silversides to any of my fish or anemones for two reasons. The first reason is that parts of them can sometimes be hard for them to digest, such as the skull and bones. Although they can handle this, it would be best if they could avoid it completely. The second reason is the low quality of silversides as a food source. When the silversides are harvested from the ocean, they are not individually inspected for signs of disease. In addition to that, silversides are not given the same level of care as human foods often thawing out during transit only to be refrozen again and again. As I do have these very same concerns about all frozen fish food, I will always try to make my own food as much as possible to help avoid the risks. If you have any questions about this topic, please feel free to ask them in our forum. If you are not already a member, it will only take a minute or two to sign up. It’s good to get a fresh way of lokoing at it. 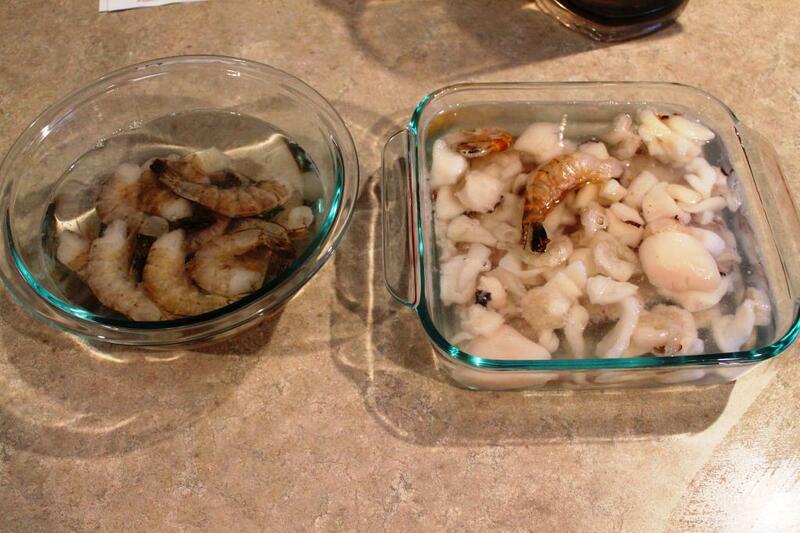 The biggest challenge faced by a lionfish owner is providing a proper nutritious diet. Of all the problems I see with lionfish, improper nutrition and its results are the predominant health issue for captive lionfish. In the wild, lionfish eat smaller fish and invertebrates. Unfortunately, in the home aquarium lionfish will readily accept live wiggling feeder fish like feeder goldfish or rosy red minnows. The reason this is a problem is that only freshwater feeder fish are available to hobbyists and they do not provide the proper nutrition. In fact, a lionfish fed exclusively with goldfish will frequently die prematurely due to a number of feeder fish-associated problems. A study by Toonen et al (Toonen, 2000) demonstrated that freshwater feeder fish of the carp family (like goldfish, rosy reds, etc.) are very high in fats and lack all the marine based highly unsaturated fatty acids (HUFAs) required for proper health of marine fish. Of all the freshwater feeding choices available to the hobbyist, ghost shrimp are the best of what’s available. 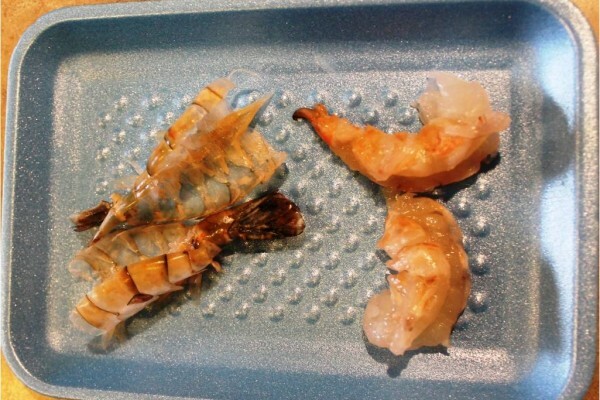 Ghost shrimp can be enriched in marine-based HUFAs by being fed any marine flake food or marine plant material, and I have not found a lionfish yet that will ignore a ghost shrimp. The best way to ensure a lionfish remains in proper health is to feed it a varied diet of fresh and frozen seafoods. With that said, I would recommend to anyone keeping a lionfish to establish the fish in the aquarium by temporarily using freshwater feeders such as ghost shrimp, guppies, mollies, rosy red minnows, and goldfish for 2 weeks up to 1 month maximum. After this establishment period, the lionfish must be weaned off these feeders and onto marine-based prepared foods. All excellent points Silver. That is why I feed my lionfish the above foods. I wish more poeple understood the simple fact you can not feed FW feeder fish to marine fish over the long term. How do you actually present the food to an anemone. Do you put in on a tooth pick and put it into the mouth or let the tenicles grab it? Please advise. We were given some live rock from South Padre Island, Tx that have some brown anemones on them (anywhere from 1 inch across down to 1/2 inch or smaller). I have been feeding them shrimp but I take the shell off, put it through the blender to make the pieces really small, then strain it through a net to get the pieces even smaller. Then I use a syringe to deliver the food close to the mouth. Should I be using bigger pieces? After feeding they close up for a little while but a few days later they really close up and stay that way …. Have you been able to identify what type of anemones you have ? You also have to keep in mind, there is most likely two things going on right now. As you just got this live you and placed it in your aquarium, your water quality may be off a little now causing stress in these anemones which would explain the behavior. In addition, you may have to wait a few weeks for them to settle in and get used to there new home (assuming the water quality is OK). 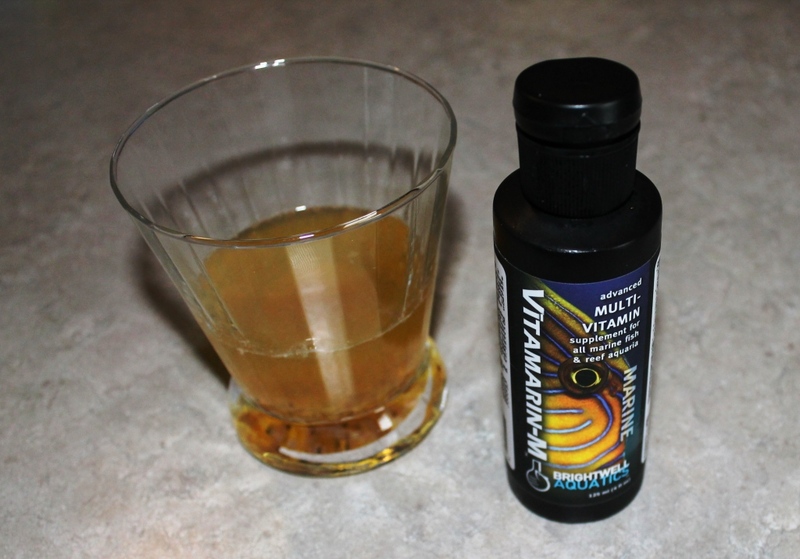 I would have two suggestions for you, 1) test your water parameters and make sure everything is OK. Complete a few water changes as well. and 2) stop feeding the anemones until they have settled in and are acting normal. Anemones do not need food to thrive assuming they have proper lighting and water conditions. Feeding a stressed anemone can actually add to the stress. This process you describe is very detailed. I will do a big shrimp, remove the shell, and insert it on a stick like shish kabob. Then I will insert the shrimp kabob into the tank, and let them eat until no more. I have not done this before. Before I have bought those hikari frozen packets, and its a mess feeding, and a waste since I never saw all my fishes devour it completely, and end up being left out in the aquarium floor.